Vagabonding in Asia without a return ticket. I have quit my job and left my daily responsibilities behind me. My home is now the villages, mountains, markets, temples, and beaches of southeast Asia - China, Tibet, Nepal, India, Malaysia, Indonesia, and wherever my travels lead me. Mandalay is not a beautiful town. The city center is loud, busy, and ugly. The enormous palace ground has an authentic moat and wall, but the interior is mostly an army camp now plus a hastily built imitation of a few of the old buildings. The city doesn't really have much in the way of tourist infrastructure - along the moat you'd expect souvenir shops and cafés but you are more likely to find tourist essentials such as shops selling air conditioners, buckets of paint, steel rebar, mattresses, and bathtubs. There are green and shady neighborhoods that look deserted and undeveloped, and others that are rather poor. I have walked all day and found a few gems, like the Ein Daw Yar pagoda area that looks more like a pleasant green village attached to an enormous market, where I sat and talked to locals for hours. English is surprisingly well spoken, and usually people didn't learn it in school, but by reading books and talking to tourists, memorizing a few new words every day. I hear German and French as well. Google's shoddy Blogger app finally posted the previous article on the 15th attempt, but not without losing the photos. Here they are. Do they test this stuff at all? Or only on the company network? Rudyard Kipling never was in Mandalay, but I am. It's a long drive from Bagan. I saw more pagodas (of course) and a number of villages. Only old people and children were there, everyone else was out working in the fields. The villages are built from bamboo and wood, there are animal pens, and large tarps on the ground where beans dry in the sun while men churn them with their feet. Young men climb palm trees to get their sap, which is used to make flavored sugar and to run a distillery. Buffalo pull grindstones around and around. All extremely rural. Also climbed some 800 steps to a mountaintop monastery. It will make a brilliant lair if I ever accept the job as evil overlord. I haven't seen much of Mandalay; I was walking the shore of the Ayeyarwady river that runs the length of Myanmar (the British call it Irrawaddy) and saw primitive bamboo huts lining the muddy beach and lots of boats and rafts unloading wood. A very primitive life. Across the street, my hotel room is so big that I can use a telephoto lens to take a picture of it. Yangon has the largest and the most golden pagoda, but Bagan makes up for that with numbers. They grow them like mushrooms. 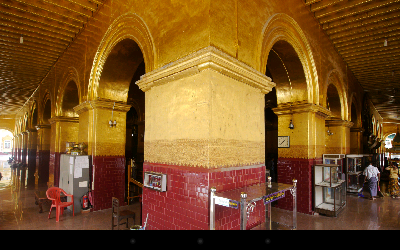 On forty square kilometers there are 2000 of them, mostly made of brick but there is some marble and gold as well. For rich people it's chic to rebuild pagodas, so many of them are rebuilt with little regard for authenticity. The guide book quips, the dodgy contractors that today "restore" piles of rubble are the descendants of the dodgy contractors who threw up the originals from the 11th to 13th centuries, at a furious clip of one every two weeks. Anyway, the result is stunning. No matter where you turn, there's a pagoda rising over the trees. Many are quite large and most contain a Buddha statue, or one for each direction of the compass. Plaster has mostly fallen off but some intricate frescoes remain. The highlight was a pagoda that could be climbed, for a fantastic view of the plain. There are many pagodas around Yangon, more than one would think people would need, and I have seen a number of them today including one on an island in a lake, where no shoe may be brought to the island. 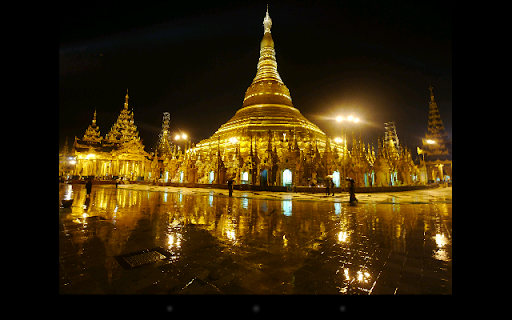 But the largest and most famous one is Shwedagon. It's almost a hundred meters tall and surrounded by hundreds of smaller chedis, all covered in gold. The effect is absolutely stunning; this must be one of the world's most beautiful sights along with places like the Taj Mahal or Angkor. Normally visiting a pagoda takes maybe half an hour. At this one I spent four hours just looking at it, and talking to a monk for several hours who came here from his monastery in the delta to see the place. Talking to him confirms my impression of Myanmar so far: a people that have been in chains for decades and now see their country grow at an incredible speed. Three years ago a cell phone cost US$ 4000, now 100 and dropping. Three years ago the government was raiding monasteries, and now this monk has Gmail account. Stop reading travel books on Myanmar, they are hopelessly outdated by the time they appear on the shelves. Not all is well in Myanmar but everyone has a gleam in their eyes and has high hopes for the future. Myanmar, also called Burma, was until recently a highly locked-up military dictatorship. Hard to get in, hard to get out. It's now changing rapidly. Yangon, the largest city, is changing at a breackneck pace. Just now emerging from its time capsule, it's full of beautiful but very dilapidated colonial architecture. Life happens on the street, there are few traditional shops, and the usual brands like Coca Cola, Wall's ice cream, and McDonalds are completely absent, one of the very few places in the world where this is the case. On the other hand, streets are packed with cars; there are no motorcycles and almost no bicycles, and no modern public transportation system. The place is headed for a traffic collapse. People are friendly and curious, always ready to smile and chat, even in this big city of about six million (nobody knows exactly). People do speak a few words of English and that's enough. Even children, one boy was trying to pimp! A society in upheaval... Normally I like street food but I have avoided it here because the stalls set up on the broken sidewalks seem unusually dirty. Everywhere in southeast Asia people prefer to fix broken things for decades, instead of throwing them away at the first sign of wear like we do, but here it seems they have to make do with equipment dating back to Napoleon. But in general, Yangon is a lot more developed, and modernizing much more rapidly, than I expected.